thoughts on archives, libraries, culture, and everything else. Download the full poster (.pdf)! Established in 2007, Kartika Review is an online, open access literary arts journal that publishes emerging Asian American writers and artists. All of the journal’s editorial work exists digitally, as the editorial staff is dispersed across the country and communicates mainly through email. This project aims to create a digital preservation program for the journal. 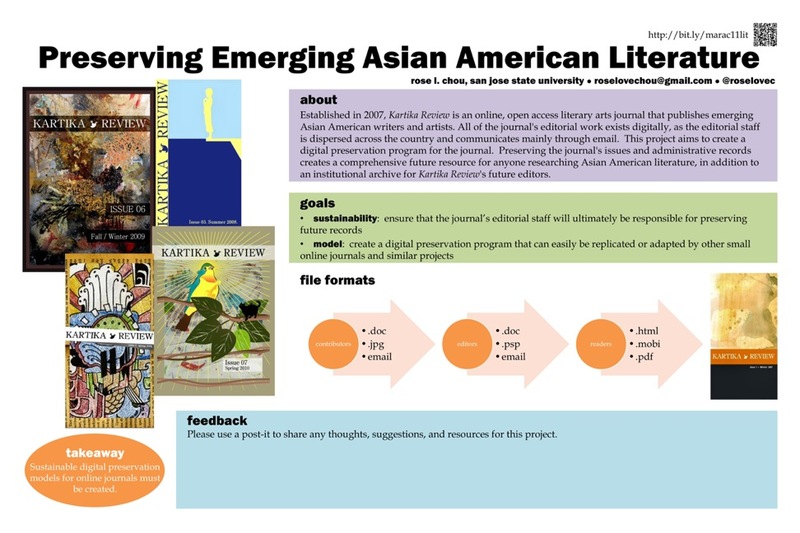 Preserving the journal’s issues and administrative records creates a comprehensive future resource for anyone researching Asian American literature, in addition to an institutional archive for Kartika Review‘s future editors. Sustainable digital preservation models for online journals must be created. This project is ongoing, so please share any thoughts and suggestions! Comment below or contact me using the information listed on the contact page. This blog is licensed under a Creative Commons Attribution-NonCommercial-ShareAlike 3.0 United States License.